Mac and cheese, grilled cheese sandwiches and tomato soup come together in one great recipe! 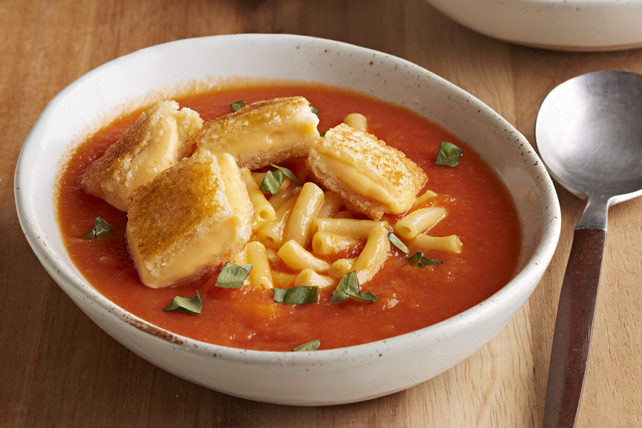 Our Mac & Grilled Cheese Tomato Soup is a weeknight winner. Prepare Kraft Deluxe as directed on package. Meanwhile, melt 2 tsp. butter in large saucepan on medium heat. Add onions; cook and stir 5 min. Stir in broth, water and tomatoes. Bring to boil; simmer on medium-low heat 10 min. or until onions are tender. Blend tomato mixture, in small batches, in blender until smooth, returning each puréed batch to saucepan. Keep warm until ready to serve. Fill bread slices with Kraft Singles to make 2 sandwiches. Spread outsides of sandwiches with remaining butter. Cook in skillet on medium heat 3 min. on each side or until Singles are melted and sandwiches are golden brown on both sides. Cut each sandwich into 12 pieces. Spoon Kraft Deluxe into 6 bowls; top with basil, soup and grilled cheese "croutons." Prepare using 1 pkg. (350 g) Kraft Deluxe Velveeta on Shells Pasta & Sauce.